I was talking with a customer recently who was looking for better ways to employ social media in their marketing, and the following idea came up. 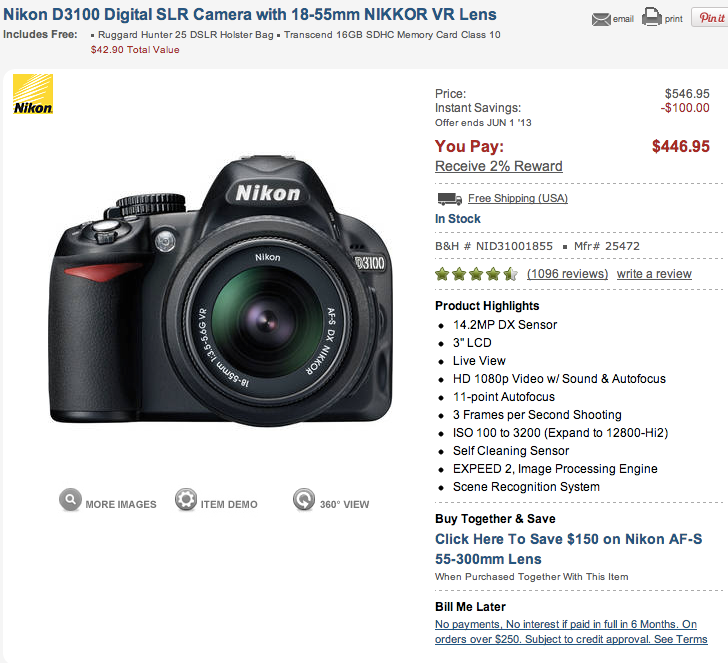 It's essentially a new kind of content for e-commerce marketing: other people's blogs. I hadn't heard of anyone doing this, but it could have a big impact for some businesses. And I have a couple relatively low-effort ways for you to experiment with it yourself. We all know that social proof matters a lot in sales. User reviews, customer logos, and celebrity endrosements on product pages address exactly that need. A page with social proof on the page will generally convert at a higher rate than a page without such proof. What I'm proposing is a new kind of social proof—essentially somewhere between a user review and a celebrity endorsement—that has already been written for you for many of your products. For many products on your site there exists today a blog post by a respected blogger somewhere on the internet that says good things. So my idea is to take a snippet of the blogger's review about a product and highlight it on your product detail page just like you would a celebrity endorsement. Quote the glowing words about the product in large text, use the author's name, and maybe even link back to the source (though you can get away without the link itself; I'll get to that). This has benefits beyond the obvious product endorsement. First, even quoted content on your site will be looked at favorably from an SEO perspective. Google is smart enough to not punish excerpts (copying a blog post wholesale is a no-no), and in fact rewards pages that link out to other sites. Moreover, the blogger will appreciate the inbound link from your site to theirs and, in a future product review, may link back to you instead of Amazon, especially if you send them a quick note saying, "Great review! Just so you know I've quoted you and linked back to your site; couldn't have said it better myself." The world of linking and blog tends to be a bit quid pro quo in this way, and an inbound link to a specific product on your site from a well-known (or even modestly known) blogger can drive significant sales. And, honestly, you probably don't even need the link if you don't want to link out. Most bloggers will appreciate being recognized as an expert whose opinion matters and is taken seriously, but it's definitely worth checking in with them to make sure. My bet is most will say, "Absolutely! Just make sure it links back to my blog." Let me give a quick example on a live e-commerce site. Ken Rockwell is very well known in the circles of camera enthusiasts. He seems to be on a mission to test and review almost every camera known to man and his recommendations are very well respected. I want to include Ken's amazing quote to help drive conversions, so I take his quote, give him attribution, and, in the words of Emeril, BAM! Instant social proof. And even though the design of the quote is terrible (I am not a designer), this page is still more effective than the one above. 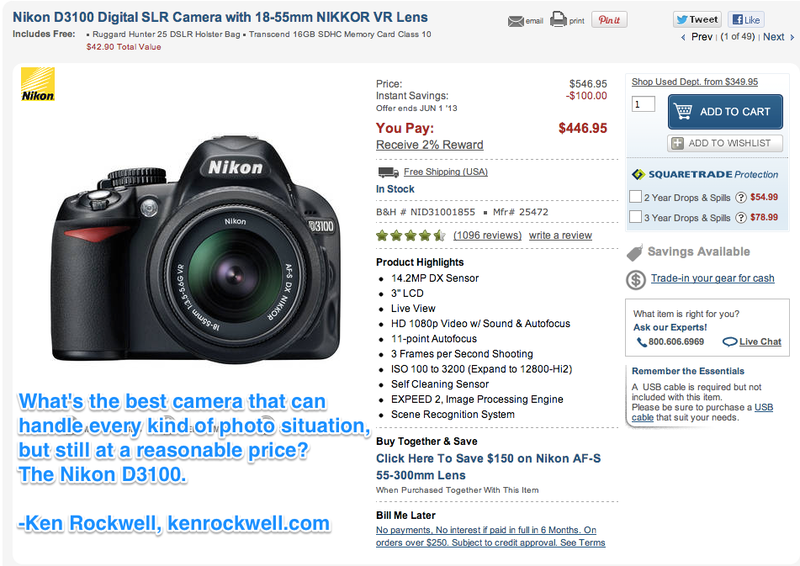 Are you more likely to buy this camera with the quote there? I certainly would be. The endorsement is powerful, and Ken gets the caché of being the quoted expert. Moreover, anyone curious about "who is this guy?" will find him at the top of their search for "ken rockwell" on google. He gains a fan, I gain conversions, and everyone is happy. Since this is a relatively new idea, there isn't some magical plugin that just makes this happen for your site. It will take a little elbow grease to get going, but here are a couple ideas to lessen the burden. First, don't try to boil the ocean. Pick a small handful of products (10 is a nice round number) on your site to test out. See if these endorsements drive conversions, and see if the bloggers appreciate your links by linking back at some point. Pick products that get enough traffic to be meaningful; a product that gets 20 views a month won't cut it, but a product that gets at least 20 views a week should show statistically significant improvement over a month, for example. Second, don't kill yourself trying to find a great blog review for every product. If you can't find a good one in your first 5 minutes googling around then move on. You should be able to nail the research end of this in an hour. Third, don't overstress the design of the quote too much. Remember: you're looking to test this out, not have the finished, super-polished solution on day one. Starting off a little rough isn't going to kill you and won't turn off prospects (look at any page on Amazon; it's still very 1998 but printing money nonetheless). Your goal is to get going as soon as possible. Once your 10 products are set up, check back using your analytics tool later in the month and see how your pages with qutoes compare to their historic performance. If this does work and helps your site close sales, then you'll want to use the trick on many more pages than you personally can affect. So how do you get that done? My personal suggestion is to use a service like Odesk.com to farm out the research work. Using Odesk you can get a skilled personal assistant somewhere in the world (I've had great success with a couple admins from the Philippines, for example) at very low hourly rates to do the internet research. Simply give a list of products, a couple examples of what you're looking for, and a time limit and wait for the results. Not every result will be perfect for sure, but you're buying yourself time, not perfection. This will help you generate hundreds and hundreds of solid quotes from other people's blogs in no time. If you do try this out, or have questions about the best way to get started, please let me know! An email to rob at salsify.com will do the trick, as will a comment below.